Pope Francis has described the impact of abuse committed by members of the Church in Ireland as an “open wound,” in his address to pilgrims in Knock. Speaking in the Co Mayo village this morning, he said that: “None of us can fail to be moved by the stories of young people who suffered abuse, were robbed of their innocence and left scarred by painful memories. “This open wound challenges us to be firm and decisive in the pursuit of truth and justice,” he said. “I beg the Lord’s forgiveness for these sins and for the scandal and betrayal felt by so may others in God’s family,” he said. “I ask our Blessed Mother to intercede for the healing of the survivors and to confirm every member of our Christian family in the resolve never again to permit these situations to occur,” he said. He was clapped by members of the congregation at several points. There has been global attention focused on how the issue of abuse is being tackled during this visit. He delivered his address at a lectern, as a translation was provided on the big screens for the assembled pilgrims. Pope Francis also noted his inability to include Northern Ireland on his two day itinerary. "My pilgrimage to Knock also allows me to address a warm greeting to the beloved people of Northern Ireland." "Although my journey for the World Meeting of Families does not include a visit to the North, I assure you of my affection and my closeness in prayer." "I ask Our Lady to sustain all the members of the Irish family to persevere, as brothers and sisters, in the work of reconciliation." Pope Francis also spoke of the importance of ecumenism. He also included a prayer for those in prison. Yesterday, he held a one hour meeting with survivors of clerical abuse, which was held at the Papal Nunciature, just off the Navan Road. 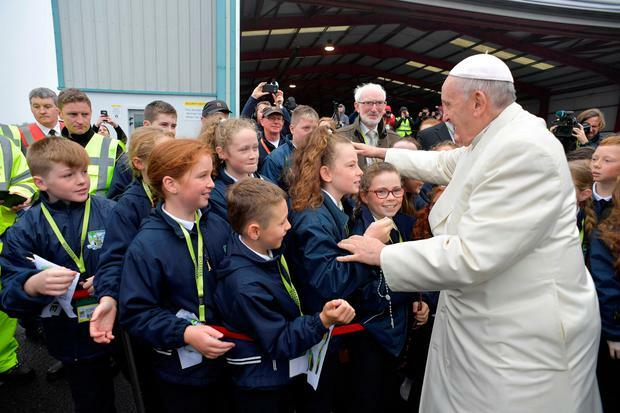 The Pope touched down in Ireland West Airport this morning, and arrived in a cavalcade at Knock Shrine. He got into his Popemobile and travelled around the shrine. The bells rang out this morning in churches in six dioceses to mark the beginning of the gathering at Knock shrine. The three backdrops to the Papal stage were designed by local graphic designer Sinéad Mallee who is based in Knock. The centre panel measuring 3.5m wide by 6m high depicts a monotone of the Knock Apparition scene of 1879 as a watermark against a vivid blue background. The left panel depicts a closer view of the detail of the figures of Our Lady, St Joseph, St John the Evangelist and some of the Knock witnesses. The right panel depicts a closer detail of a lamb and cross on an altar of the gable wall of the Parish Church surrounded by angels, representing the Lamb of God. Pope Francis lit a candle in a display centred on the hewn-out stump of a tree that fell in the shrine grounds last winter. Fifteen parishioners of Knock shrine dressed in period costume represented the original witnesses to the apparition in a ceremony earlier today at Knock. The origins of Knock as a place of pilgrimage and devotion date back to the 21st century 1879 when 15 local people aged from 5 to 74 witnessed an apparition on the gable wall of the Parish church. 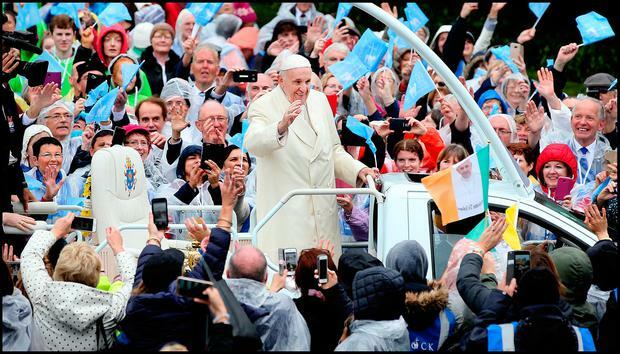 After his visit to the Shrine, the Pope boarded his flight back to Dublin at approximately 11.20am. His visit west has been brief having arrived shortly after 9.30am. He will join crowds gathered in the Phoenix Park at 2.30pm before leading mass at 3pm.